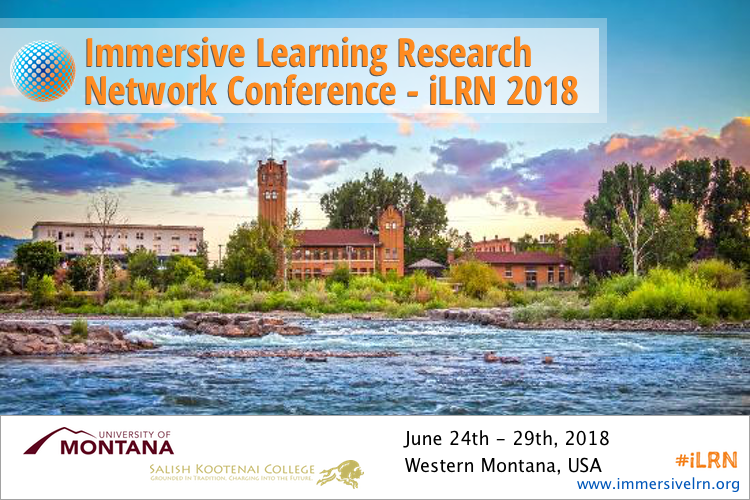 The Immersive Learning Research Network (iLRN)’s 2018 Conference Board invites you to submit proposals to host and conduct one of iLRN’s Special Tracks on June 24th – June 29th 2018 in Missoula, Montana. For this 4th annual conference we seek to continue to advance our shared understanding of the full “DNA” necessary to make high quality immersive learning experiences. Your specialized focus and immersive learning-related research may find richer context and deeper meaning within a Special Track! We are interested in discovering, showcasing, and sharing how Immersive Learning experiences are best made and/or applied. Contribute a Special Track to the iLRN 2018 experience! While we’re always encouraging and accepting iLRN Special Track proposals from researchers, artists, and developers focused on digitally enhanced immersive learning — special to this year, iLRN is announcing a specific interest in an applied sector: iLRN’s Research Agenda 2018 focuses on immersive learning research in the realms of Environmental Sciences & Cultural Heritage. Deep understanding of content within either of these fields is best achieved through ecological and highly situated contexts. We, like others, assume that these areas may be specially advanced through immersive learning. Solutions to complex ecological problems and understanding of cultural contexts require not only scientific expertise, but also understanding of the situated experiences in which they occur. Cross-cultural competence thus becomes an important and heretofore elusive component of functioning effectively in the global scientific community. This is also particularly true in the environmental disciplines, where science and culture intersect with the potential of immersive technologies to enhance learning through presence, multiple perspectives, and learning transfer from one experience to another (Dede, 2009). 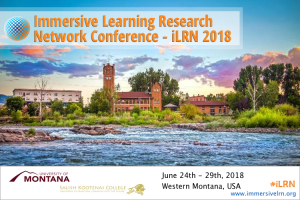 iLRN 2018’s setting in western Montana is an optimal context to showcase our growing interdisciplinary knowledge base on how to use immersive learning for advanced human conduct. Topics of interest for Special Track proposals may vary widely, but special priority will be given to those that focus on and propose to conduct a high quality Special Track that meaningfully resonates with the conference theme. Special Track proposal submissions should contain the following sections in the suggested order and must not exceed 2 pages. The only accepted format is PDF. A concise Special Track title. The names and affiliations of the organizers; typically it should count no more than three co-chairs preferably affiliated with different organizations. Proposed duration of the Special Track (one session (1.5 hours, half or full day). A two-paragraph description of the Special Track topic, themes and relevance. Please note if part of the iLRN Special Call for either Environmental Sciences and/or Cultural Heritage. If the Special Track was conducted before, where and when was it conducted? A description of the Special Track format: contributions must focus on sound research. Publications to be submitted and published must follow formats specified in the main conference (long and short papers). Please also outline, if invited speakers are involved. A description on how Special Track submissions will be evaluated, and a tentative Program Committee (PC) list (with indication of whether PC members have already been contacted and/or have expressed interest.) Indented deadlines for distributing the call, contribution submissions and the review process must be outlined. Deadlines for notification of authors and final paper submission must be in line with the deadlines outlined in the main conference. It is expected that Special Tracks will be open to all interested registered iLRN Conference parties. A short bio of the special track organizers, including a description of their qualifications relative to the topic area, and past experience in organizing/facilitating research meetings. The review process of proposal submissions focuses on the expertise of the Special Track chairs as well as the relevance and soundness of the Special Track topic, the quality of the PC members, and the review process for the Special Track itself. Preparing and distributing the call for contributing to the Special Track. Setting up a quality review procedure and ideally a submission and review system following the deadlines of the main conference. Providing a one page abstract summarizing the Special Track to be published together with the papers of the Special Track. The abstract must follow the style guideline und must include title, name and affiliations of Special Track chairs, background and motivation of the Special Track, and summary of the review process. Please use the iLRN submission system https://www.easychair.org/conferences/?conf=ilrn2018 and select ‘Special Track‘ when adding your proposal. All submitted special track proposals will be reviewed by the Special Track and Workshop Co-chairs and selected board members following the quality aspects published in the detailed call text. For the quality aspects please refer to the Authors’ Kit. A selection of the best papers from Special Tracks will be considered to be published in the Springer proceedings. In order to keep the quality of full papers on a high standard, less than 35% are considered to be added to the Springer proceedings. The other papers will be added to a non-index proceedings volume assigned by an ISSN number and only online accessible.